Irrational Games is developing BioShock Infinite in such a way that the PlayStation 3's unique architecture won't be an issue. The PlayStation 3 has been criticized by developers since its release for what they say is its complex development environment. If you've been worried that this environment could affect Irrational Games' upcoming BioShock Infinite, don't, because the company has a development structure in place to specifically negate any PS3 issues. 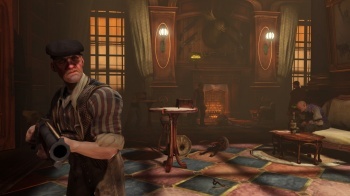 In a post on the Irrational Games forums, the studio's technical director Chris Kline replied to fans' questions about how it was handling the PS3 version of BioShock Infinite. He says Irrational is "serious about making sure the PS3 version is great," and wants everyone to know that it won't be a "port" of the PC or Xbox 360 versions. To do this, Irrational is actually making the development of the game harder. Kline says that instead of declaring the PC, PS3, or Xbox 360 a "lead platform," it has "changed the game engine so that all platforms look (to a programmer) more like a PS3." Some technical details are in the post, but Kline basically wrote that this is both optimal for the PS3 and provides speed improvements on other platforms. Kline also detailed the testing environment that Irrational has created to ensure that the PC, PS3, and Xbox 360 versions are all up to speed through every change made. Through these processes, Irrational is simultaneously developing all three versions of BioShock Infinite in-house rather than handing one off to another studio. Kline wants BioShock fans to have "confidence" that it's going to put out a great game on every platform. For the gamers that only own one console but still want to get in on Infinite's awesome looking gameplay, that's good news indeed. As a sad reminder, the game still won't be out until 2012.